With majors in industrial design and apparel design, ISU graduating senior Colin Behr is headed for his ultimate dream job. Photo by Christopher Gannon (larger image). AMES, Iowa -- Colin Behr’s obsession with shoes probably started before he could walk. That’s when his uncle graced the baby boy with a pair of infant Air Jordans. The Baby Jordans that started it all. Twenty-three years later, Behr is walking off the stage at Iowa State's commencement and into his ultimate dream job — designing footwear for Nike, the company responsible for those Air Jordans. Graduating with a double major in industrial design and apparel design, Behr thinks he may need to pinch himself awake. But his footwear designer job for Nike Sportswear is no dream. Actually, luck had little to do with it. Behr is a walking, talking poster boy for the Nike brand: Just do it … Nothing is over until you stop trying … Take charge … Write your own story … Find your greatness. 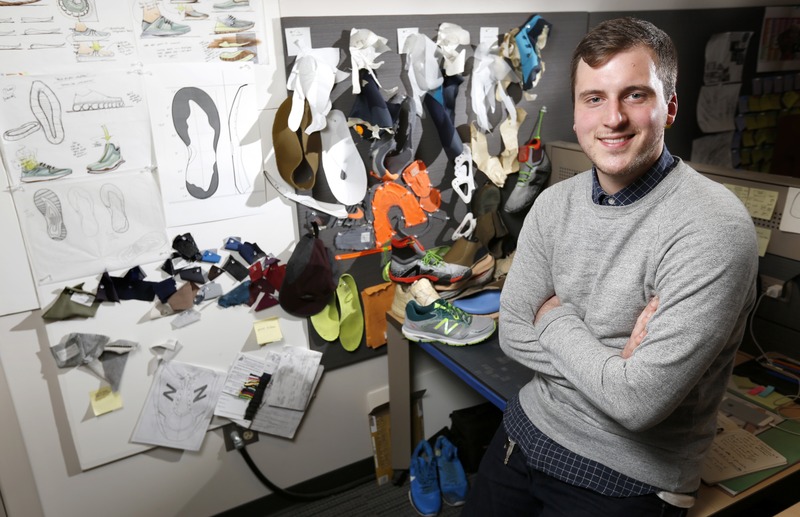 In five years at Iowa State, Behr has designed three pairs of shoes sold by New Balance, put finishing touches on a Todd Snyder New York designer parka for the ultra tony retailer Barneys, studied shoemaking at the London College of Fashion and co-designed a football receiver glove about to be manufactured by Shock Doctor for Cutter’s. Behr lived and breathed basketball growing up in Marion. His uncle took him to his first Chicago Bulls game when he was five. He was “your traditional MJ kid.” A standout basketball player in school and AAU, Behr surely was headed for a small Division I college team. Until he dislocated his kneecap. Not once, but five times. In four years. He underwent two surgeries. Screws hold his knee and tendon in line. Behr spent more time on rehab than on the court. Behr’s dad, Randy, a graphic designer and ISU alum, stepped in with a diversion — his sketchbook from college and high school. “I had always liked art and drawing. So that was automatically something to lean on and help me through. It kept me from freaking out,” he said. “I definitely could’ve picked up worse habits. I was blessed by my dad’s guidance. So Behr shifted his work ethic from shooting hoops every day to drawing every day. It all tied together. He was obsessed with shoes. He drew shoes. He wanted to design shoes. But shoe designing wasn’t exactly a career path one discusses with one’s high school counselor. “I didn’t even know it was a real job. How do you design shoes,” he said. A sneaker blog provided the answer with an article about shoe design that showed some (“Oh. Wow.”) actual sketches. He learned that Tinker Hatfield, the Nike designer of Air Jordan and Nike Air, had started out as an architect. “So I went to ISU to become an architect and hopefully would fall into footwear someday,” Behr said. Instead, he fell into industrial design. During freshman year, a friend told Behr about product design as a profession, sharing his sketchbooks and textbooks on industrial design sketching and conceptualization. “I thought, ‘That’s it.’ From that point on I was set on getting into the shoe industry,” Behr said. Although he loved industrial design, he realized it was, well, industrial. Behr wanted to design a fashion collection and work more in soft goods than in woods, metals or plastics. He added a second major in apparel design after sophomore year. “Industrial design teaches a broad approach to design. You learn a way of thinking ­— to research and design iterations that make improvements. The amount of work is really intensive. There’s no answer coming out of a textbook. It’s in your work,” he said. “Apparel design at ISU is technical and specific to women’s wear — patternmaking, sewing and textile science. When you come out of the ISU program, you’re going to know every construction detail about how to put something together,” Behr said. His advisers first said it couldn’t be done. He couldn’t take two studio classes in one semester; he couldn’t complete apparel design in three years. At the same time, they made sure that he could. They helped Behr work out the schedule he needed, take the study abroad program he wanted, complete the internship he earned and add the internship he won. Behr’s not sure how he survived the next two years, taking 19 to 20 credits per semester, working part-time, and living in two countries and three states. In London for the summer shoe design program, he designed a collection of six shoes and completed a shoemaking short course. He learned the basics of each step of transitional shoemaking. The day before flying to London, Behr was offered a fall internship in footwear design at New Balance in Boston. “Every morning, I literally popped out of bed and couldn’t wait to get to work,” he said. Behr's New Balance team was tasked with bringing a shoe to market in nine months — half the standard development time. Behr created a shoe concept that was manufactured as a prototype sample in less than a month at the company. New Balance produced and sold three pairs of Behr’s shoes. A year later, his family walked into Kohl's and bought five pairs. “It was crazy to see them on the shelf. It’s still surreal,” he said. The design and product development summer internship with Todd Snyder New York fit the bill. He managed production of a parka for Barneys New York — doing everything from schlepping 50-yard bolts of fabric across Times Square in the rain to scouring fabric and trim stores for every button, snap, Velcro and fur trim on the jacket. In a few short weeks, the garments were in a Barneys display window. And all that pushing harder and positioning wisely has put Behr exactly where he wants to be. “There’s been a huge boom in performance fashion—street wear and shoes made with performance fabrics. It’s a mix of high fashion and d performance — essentially my internship experiences. "I thought it would take more steps to get to Nike, but they invited me for an interview even before they saw my portfolio," he said. This semester, Behr's friends told him he could take it easy; he needn’t worry about class projects because he had a job already. Seems Behr was the perfect fit for Nike Sportswear. Graduating with a double major in industrial design and apparel design, Colin Behr thinks he may need to pinch himself awake. But his footwear designer job for Nike Sportswear is no dream. In five years at Iowa State, Behr has designed three pairs of shoes sold by New Balance, put finishing touches on a Todd Snyder New York designer parka for the ultra tony retailer Barneys, studied shoemaking at the London College of Fashion and co-designed a football receiver glove about to be manufactured by Shock Doctor for Cutter’s. "That’s the best thing about ISU. You can make it what you want. If you’re really passionate about something you can do it. Nobody says you can’t."